Effectiveness of legal aid in criminal proceedings in Albania | Qendra "Res Publica"
In the framework of a project supported by Open Society Foundations, Hungary, and more specifically by the Human Rights Initiative, Res Publica has undertaken a study on the effectiveness of legal aid in the criminal proceedings in Albania. The study was conducted through a preliminary investigation of 5152 judicial decisions of the Tirana Judicial District Court and a thorough investigation of 100 case files. Quantitative evaluation was also supplemented by data from 3 focus groups with judges, prosecutors and ex officio lawyers that are part of the list of mostly appointed lawyers by the court. The monitoring of 200 court hearings supplemented the study with additional data. Quantitative and qualitative data were accompanied by an analysis of the legal framework and the manner in which the rules are applied in practice by the state authorities that administer legal aid. 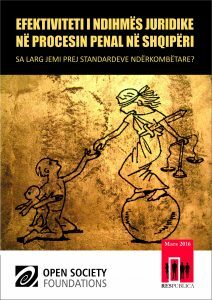 Comparative analysis between the international findings and standards in this field pointed to how far we are from these standards, demonstrating the necessity of a radical change in the legal aid scheme in Albania’s criminal proceedings. Click on this link to download the full report.